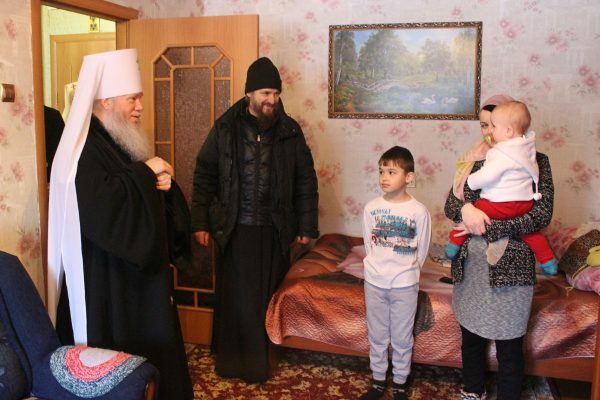 The project was implemented with funds allocated by the Synodal Department for Church Charity and Social Service’s competition for initiatives in the field of abortion prevention and the organization of assistance for pregnant women, mothers in difficult situations, and low-income and large families. The new center provides temporary shelter, operating in agreement with other local social programs providing assistance to families and children. Met. Joseph visited the social hotel Quiet Harbor, celebrating a moleben and sprinkling the premises with Holy Water. One family is already living in the center. The new facility also operates an around-the-clock hotline for pregnant women and women in crisis situations to consult with an Orthodox psychologist or lawyer; a consulting and information center where a psychologist, lawyer, and social worker hold informational and educational activities on the family, the joy of motherhood, and a healthy lifestyle; and a humanitarian aid charity providing clothing, food, and other types of material assistance to troubled and needy families. The 58th such shelter was opened in October in Livny in the Oryol Province. The Russian Church also operates about 170 humanitarian aid centers throughout the country.